Feminist economists have an impact on policy; however, those impacts are not often immediately apparent. I was starkly reminded of this when, in early August, I had the opportunity to do a day’s teaching on “Gender and the Economy” in English and Vietnamese to the Ho Chi Minh National Academy of Politics and Public Administration in Hanoi. As the educational arm of the Communist Party of Vietnam, rising senior Party cadres attend a 3-month compulsory course on economics, public policy, and Marxism-Leninism-Ho Chi Minh thought. In an audience of 90, 79 were men and 10 of those were vice-ministers (effectively the number two in the ministry), including the Deputy Minister of Finance, along with more than 10 Provincial Secretaries of the Communist Party as well as senior generals in the armed forces. It was a very high-profile group from around the country that, ranging in age from the late 30s to the late 40s, represented the next generation in the leadership of the Party. Although the day was organized by the Center for Women in Public Administration and Politics (WiPPA), a newly established center within the Academy, I was aware that I had to be careful about how I spoke. So when I started the day by discussing the feminist economics critique of neoclassical economics, to which most of the attendees had some exposure, I didn’t use the “f” word and instead used the UN code-word “gender-responsive economics”. We discussed the economic characteristics of unpaid care work, which was grounded in my 20 years of experience living in and working on Vietnam. When I asked for questions from the floor, people’s freedom to speak their minds meant that many of the old stereotypes that persisted through central planning and renovation reared their head: that the Vietnamese gender division of labor was cultural and that people did not want their culture to change; that Vietnamese households shared their incomes and assets; that women enjoyed and preferred unpaid care work; and that the policy implications of recognizing unpaid care work were not self-evident. Vietnamese women working. From Wikimedia Commons. Public Domain. Photo by Linda D. Kozaryn. Gently rebutting the stereotypes that were laid before me by the gender-blind cadres, I was able to lead on from the last point by displaying to the cadres the very limited evidence that is available on the distribution of unpaid care work in Vietnam, which strongly indicates, not surprisingly, gender-based inequalities in its distribution that have persisted for almost two decades. Explaining that supply depends upon the labor force and its productivity and with the fertility rate in decline, Vietnam was facing a major constraint to the country’s long-term economic development. 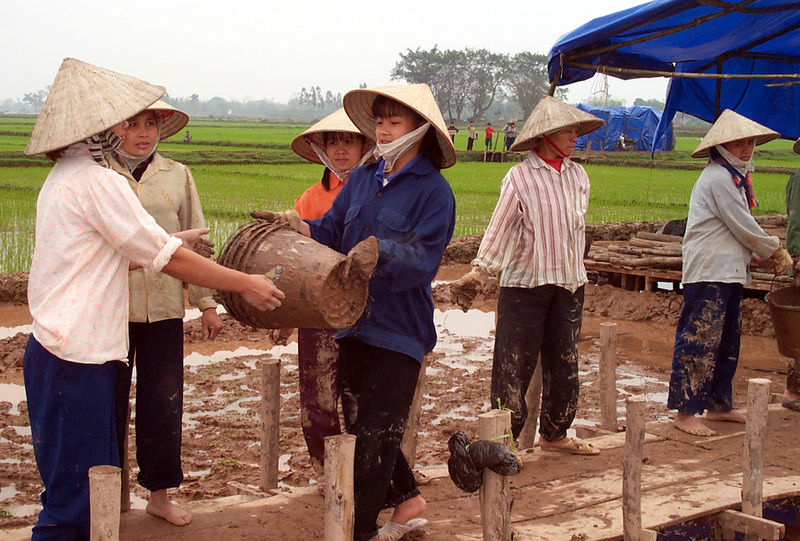 The ability to draw low-skill, low-productivity labor into the cities will diminish over time, and unless a policy framework is introduced that recognizes unpaid care work, there will be an impact that, in the long run, will affect the rate of growth of the Vietnamese economy. This made the group sit up and pay attention. In the discussions that followed, some, including a significant portion of the men in the group, were paying attention to unpaid care work in a way that was brand new. I concluded the day by discussing the role of unpaid care work in Asia’s response to the global economic crisis. As Diane Elson (2010) and others have demonstrated, unpaid care work was used by households as a private form of social protection. As a result, the crisis intensified gender inequalities and was intensified by gender relations. This allowed me to show the long term implications of a feminist economics understanding of macrodynamics for the Vietnamese economy, and some of the more immediate issues facing economies with high numbers of people employed in informal and vulnerable paid work. When we finished, a number of the cadres thanked me for my contribution and encouraged me to continue researching and teaching. WiPPA was very pleased with the results, believing that the day finally allowed the organization to be recognized in a more meaningful way. The number of non-Vietnamese who have been asked to deliver lectures to the Communist Party is very small, but I remain hopeful that what I said during the day had an effect and offered a new way of looking at Vietnam’s economic challenges. Of course, that does not equal policy impact, but at the end of the day I felt, as I often do when I teach feminist economics to policymakers in Africa and Asia, this is why I do this job. Elson, Diane. 2010. “Gender and the Global Economic Crisis in Developing Countries: A Framework for Analysis.” Gender and Development 18(2): 201 – 212.